Jack Black is an American comedian, movie actor, and musician. He is best known for his roles in comedic films for which he has been nominated for a number of MTV Movie Awards and two Golden Globe Awards for best actor in a musical or comedy. 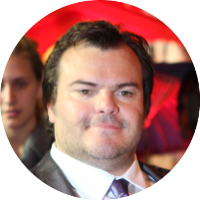 Jack Black has also hosted the MTV Movie Awards and the MTV Video Music Awards. In 1994, Jack Black and his friend and fellow musician/actor Kyle Gass formed the comedic rock group Tenacious D.
Jack Black would appear to have a number of famous kin through his 3rd great-grandmother Eliza Ann Darling, wife of Noah Davis. She is said to be the daughter of Joseph Benedict Darling and his wife Nancy Ann Lacey. Joseph is said to be the son of Samuel Darling and his wife Elizabeth Benedict. Unfortunately I have not been able to find any reliable sources to support this claim.